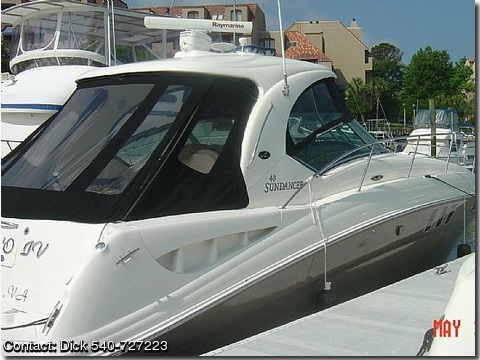 Like new 2006 Sundancer 400 with 60 hours and extended six year warranty. Hard top with Pewter hull and black custom canvas. Full Raymarine E 120 electronics 12" screen with GPS/Chart plotter/Radar/Autopilot and bow thruster and generator. Three A/C's including cockpit and four TV's and Sirus satellite radio. Has separate shower and head, refrigerator and freezer in galley and refrigerator in cockpit. Also has a central vac system. Professionally maintained with washing twice per month and waxed every three months. Both exterior and interior are in show room condition. Boat is in Hilton Head, S.C.